The past week I was in Sri Lanka supporting the Microfinance Institute DDFC. I found a potential investor in the USA and introduced him to the Board of the new bank. He was very interested and we will follow up. The past weeks I have been busy with making and organizing the investor proposal. When I arrived in Sri Lanka (always very early morning otherwise the traffic is terrible and it takes you 2 hours extra to get anywhere) I noticed all the lights and lanterns along the road. ‘Yes, Hein it’s Vesak. We celebrate the birth, enlightenment and death of the Buddha these 3 days.’ Everybody has a Holiday and it’s a bit like our Christmas. So the first afternoon I found myself praying and offering for the Buddha. What they hadn’t told me that we were going to pray and honor all the 28 Buddhas (the one you know is the 28th in the row and there will be another one in 500 years when the world is in deep crisis). Sitting cross legged. After 50 minutes my legs were completely numb and you could have amputated them without me feeling it. Bats as big as dogs were circling above our heads. Pretty impressive. Afterwards we went to the Densala: the gift of free food. It’s custom to cook for your commnuity if you can afford it. So for the Densala that we opened more than 4000 people were lining up. I can assure you: that is a lot of rice and dahl and curry. 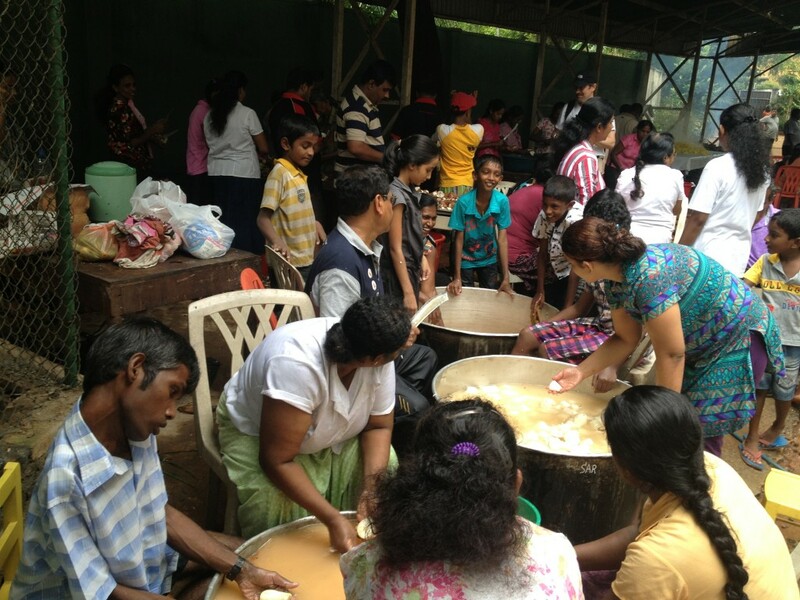 The picture above is the next day where we are cooking for the Densala organized by Sarvodaya. I slept at dr. Ariyaratne’s home (‘Hein, this is your home’) and enjoyed the simplicity and the aliveness. We meditated early morning together before we breakfast. The rest of the days were stuffed with meetings. You never know what meeting you will be in but I’ve learned not to worry or to prepare: ‘Hein, what you think will happen won’t happen and what happens you might not have thought of. So just be present.’ With this attitude I found out again that magic can happen. Their movement Sarvodaya is build on the slogan: ‘We build the road and the road builds us.’ Meaning: through the gift of voluntary labor we will awaken ourselves. For me it’s closely linked to the right side of the U: set a bold step in the ‘right’ direction and let this guide you in the next steps while staying completely present to what is. Ik boek ”Synchroniciteit” van Jaworski kwam na 9 jaar weer in mijn leven en op mijn Pad(Tao). keer,voor ‘t eerst naar Big Island Hawaííetc,etc…..
Hein het lijkt me dol-fijn jou te ont-moeten;wanneer ben je weer in Nederland?Mijn mobiele nr.